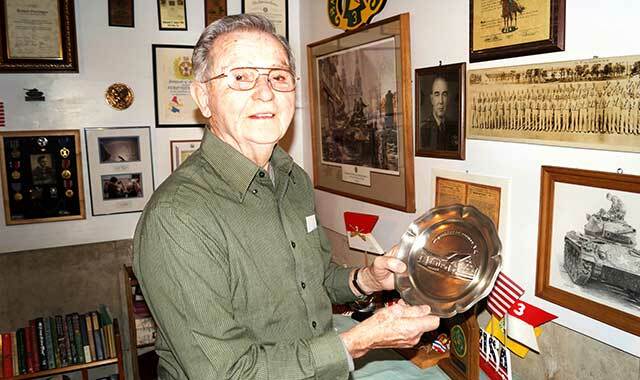 World War II veteran Bob Persinger holds up a memento from his days as a tank commander, when he helped to free Europe from Adolph Hitler’s grasp. Veterans Day has a special meaning for World War II veteran and Rockford resident Bob Persinger. He served as a Staff Sergeant and tank commander in an Army reconnaissance regiment that helped liberate France and Germany from the Nazis in the last years of the war. He found out first-hand how high the price of freedom can be on cold, winter’s day in early 1945 when his unit came under a brutal attack behind enemy lines in Germany. This was the toughest battle of the war for Persinger, a farm boy born in Weaver, Ohio on Sept. 23, 1923. He was the second of five children born to Charles and Lucille, hardworking farming parents who taught him strong values. Life became even more difficult, in 1939, when Persinger’s father suddenly died. “My two brothers and I continued to work the farm we were renting. We carried on just as if my Dad were alive,” he recalls. Persinger’s life, along with millions of others, was about to change as World War II began to devastate much of Europe and Asia. When Japan attacked the United States at Pearl Harbor, Hawaii, on Dec. 7, 1941, the U.S. entered the war. Sixteen months later, Persinger was drafted into the U.S. Army; a few months after that he was on his way to basic training at Camp Gordon, Ga.
Persinger was assigned to an M-3 Stuart light tank crew. He started out as a tank driver and was gradually promoted to Corporal, Sergeant, and finally tank commander and Platoon Sgt. at the same time. As a Platoon Sgt., he was in charge of an entire unit of light tanks. Learning how to drive a tank came easy to Persinger, thanks to his many years of farm work. “Being raised on a farm and having driven a tractor, it wasn’t that much different,” he says. Persinger first saw combat in August of 1944, when his regiment landed in France, two months after the historic Normandy D-Day invasion of Europe. His 3rd Reconnaissance Regiment helped to push the Germans out of France, liberate Paris, and move into Germany; his regiment even fought in the Battle of the Bulge. Despite months of intense training and preparation, Persinger’s unit was at a distinct disadvantage when taking on the German forces in combat. The harsh reality was that the German tanks were far superior to any of the American tanks, especially the M-3 Stuart light tanks Persinger and his fellow 3rd Reconnaissance soldiers were using. Early in 1945, Persinger’s unit got some good news: The Army would be replacing its outdated and highly vulnerable M-3 Stuart light tanks with the recently developed and better-equipped M-24 Chaffee medium tank. Even with that upgrade, the American tanks were no match for the Germans. That was so much the case that Persinger’s unit was ordered to by-pass any German tank that couldn’t be knocked out. Despite those orders, Persinger was wounded in combat while standing guard in Nazi Germany one spring night in 1945. The incident took place just outside a small German village. His tank crew slept while he stood guard in the turret of his tank, his head and upper body exposed as he manned a .50 caliber machine gun. His wounds were not serious enough to require extensive medical care, but they were serious enough to earn him a Purple Heart Medal for being wounded in combat. That incident wasn’t the only combat Persinger saw in Europe. He participated in night patrols 29 times. During such patrols, he and his crew members dismounted from their tanks and carried out missions on foot. For his actions in helping capture the German soldier, Persinger was awarded the Bronze Star. Between episodes of intense combat, Persinger occasionally enjoyed himself. He understood that he was witnessing history in the making. One of those occasions was when he came within a few feet of General George Patton, one of the Army’s best and most controversial Generals. Patton was known for his self-promotion and his “blood and guts” approach to defeating the German Army. For Persinger and the rest of the soldiers of the 3rd Cavalry Reconnaissance Regiment, the war couldn’t end soon enough. His unit suffered 82 percent casualties. That means more than eight out of 10 soldiers in his unit ended up killed or wounded during their time in Europe. To this day, Persinger often thinks about the sacrifice his fellow soldiers made, especially as Veterans Day nears. With fewer and fewer World War II veterans left to tell their stories, he hopes today’s youth will not forget what these veterans accomplished. When the war ended, Persinger’s unit was at the Ebensee concentration camp in Austria, near the Swiss Alps. His unit helped to liberate 15,000 starving prisoners from impending death. To this day, Persinger stays in touch with about a dozen of those concentration camp prisoners he helped to rescue. Persinger was discharged from the Army on Oct. 29, 1945. He headed home to help his mother, and his family made its way to Marengo, Ill. He returned to farming, for a while, before trying his hand at a number of jobs. He worked as a machinist and carpenter; He also delivered fuel to farmers in their fields. It was while he was working one of these jobs that Persinger met his wife, Arlene. They celebrated their 65th wedding anniversary this autumn, on Oct. 7. They’re very proud of the three children their marriage produced. Bob retired in 1985 and leads a quiet, happy life with Arlene at a Rockford retirement community. He enjoys woodworking in the basement of his home, playing pool with friends and spending time with his family. Although it’s been more than 70 years since he fought in World War II, the memories, both good and bad, remain vivid and forever in his mind. With each Veterans Day, Persinger recalls his fallen comrades and hopes they will always be remembered and honored by our country. Editor’s note: Author Bob Ryder is a former Marine sergeant who served in Operation Desert Storm overseas in Kuwait and Saudi Arabia, and was awarded the Joint Service Achievement Medal for his service as a Marine Corps Combat Correspondent and broadcast journalist with the Armed Forces Desert Network. Locals may remember Ryder from his 20-year career as a senior reporter and substitute news anchor for WTVO-TV in Rockford. He currently serves as the Superintendent of the Veterans Assistance Commission of Boone County, a local agency dedicated to helping veterans and their families in need. This entry was posted on Friday, October 30th, 2015 at 11:56 am	and is filed under Features, Top Posts. You can follow any responses to this entry through the RSS 2.0 feed. Both comments and pings are currently closed.